Helpers facilitate the 24 Game as part of an Algebra Academy field trip. 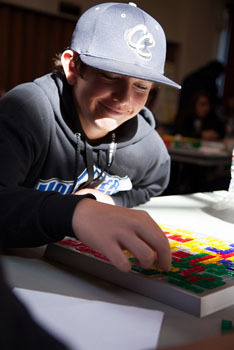 Math-oriented games highlight Algebra Academy event at Merrill College. Thirteen-year-old Alejandra Ponce selected an L-shaped game piece and fitted it carefully onto the playing board in front of her. Her goal was to block her schoolmates from placing their own geometric pieces and, thus, win the contest. What might have been even more mind-twisting for the Rolling Hills Middle School eighth-grader was that the game — part of a day-long event at UC Santa Cruz — was actually an exercise in transformational geometry and that her enthusiasm for it lies at the very heart of a unique collaboration between construction materials giant Graniterock, UC Santa Cruz, and CSU Monterey Bay. Called Algebra Academy, the program is designed to boost math education at rural schools and pave the way for more students to go to college. Founded four years ago by Graniterock’s late president and owner Bruce Woolpert, the program’s centerpiece is an intense, week-long algebra camp held at the company’s headquarters in Watsonville. 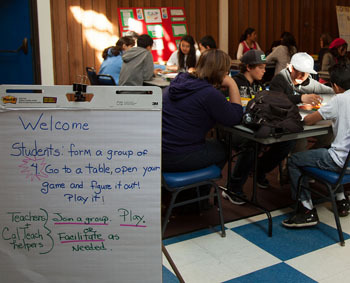 About 50 students participated in each of those first years, but thanks to Graniterock’s partnership with UCSC, the number of students not only swelled to more than 100 this year but plans are also in the works to develop math clubs and schedule math festivals at each of the program’s six feeder campuses. The day-long event at Merrill College was designed to not only kick off math-festival planning but also give eighth-graders a taste of university life. It included students from Aromas, San Juan, and Tres Pinos schools in San Benito County, and Rolling Hills, E.A. Hall, and Pajaro middle schools in Santa Cruz County. Sitting at the end of a long table, 13-year-old Leonardo Martinez of Rolling Hills Middle School was bending over a worksheet and calculating the speed of a fictitious woman’s trip to the Post Office. He said he liked the summer Algebra Academy and that he planned to be the first in his family to go to college and become a civil engineer. According to researcher and UCSC Math Lecturer Nandini Bhattacharya, the young Martinez may be right. At least one study has found that students who do well in seventh-grade math are more likely to take advanced math classes in high school — which puts them on a path toward college according to Bhattacharya, who helped lead Graniterock’s summer algebra camp along with UCSC grad student Ryan Carroll and four undergraduates from the campus’s Cal Teach program. “The potential for learning exists in all these students,” Bhattacharya said, but a lack of resources and of exposure to higher levels of math may prevent some middle-schoolers from acquiring the skills they need. Cassie Davenport, a math teacher at Rolling Hills Middle School, said she has seen the enthusiasm her students have for math following their summer Algebra Academy experience. It’s that enthusiasm that UCSC and two campus programs — Cal Teach and the Monterey Bay Area Math Project — are also helping to continue throughout the school year. 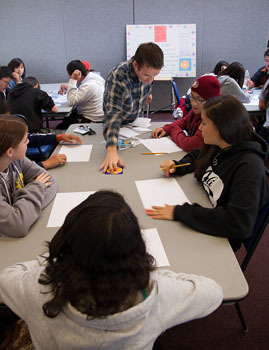 Not only will UCSC’s Cal Teach students help develop and co-lead math clubs with faculty on each of the six participating campuses, according to Gretchen Andreasen of Cal Teach, but they’ll also meet regularly with Monterey Bay Area Math Program Director Judith Montgomery in preparation for helping to organize math festivals at the schools. Susan Gallagher, an eighth-grade math teacher at E.A. Hall Middle School, sees the importance of Algebra Academy and math clubs — not only academically but also socially. For the kids who attended the UCSC field trip, the day was not only a chance to meet up with algebra friends from other campuses and to play math games, but also to tour a university campus. Or as 13-year-old Oscar Rocha said: “This field trip showed how it feels to be in college. I think it looks pretty fun."